Eileen Burgess joins us to talk about her Great Expectations Book Club. She's an original member of the group that started 15 years ago, in Mississauga, Ontario. BookBrowse interviews Eileen Burgess joins us to talk about her Great Expectations Book Club. She's an original member of the group that started 15 years ago, in Mississauga, Ontario. about all aspects of their book club. Hi Eileen. Congratulations on 15 years together! Tell us how Great Expectations got started. We started the bookclub in March of 1995. The person who started it wanted to read more so she gathered together six ladies for an evening of discussion to see if we wanted to start a book club and choose our first book. I was an avid reader of murder mysteries so I was a little hesitant, but as I am a reading junkie I decided that I would give it a go. What was the first book you read as a group? Our first book was Away, by Jane Urquhart. We got together to discuss the book and I was totally hooked. Imagine, a whole other world of books out there that I would enjoy other than murder mysteries! Have you stayed with the same core group since the beginning? We stayed with the first six people for about a year and then people started getting busy and missed more than they showed. There was no shortage of people wanting to join our little group and although our core 4 people stayed, we became 10. By then our age range for members was 30-80. It was fabulous to have so many points of view. 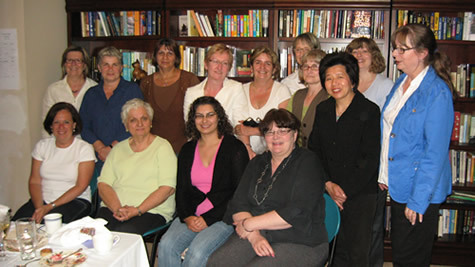 Our book club is now 15 members (we just had our token male take a sabbatical) and we have a waiting list. I am actually the only one from the original group that is left. Most of us in our 50's. One is in her 40's with young children. We are relaxed, diverse and we laugh a lot. We decided as a group that we would vote on whatever books the members suggested. Now (and for the past about 10 years) we keep track of recommended books through the year and at the end of the year we have a vote (at our year-end dinner). We usually end up with about 28 books to choose from and we need 8. I prepare a "booklet" with all of the books in it, complete with descriptions. We discuss the books over cocktails and the main course. Between the main course and dessert, we vote. Over coffee we announce the winners and determine who will present and at whose house. We have done a couple of biographies but tend to read mostly fiction. In recent years we've really tried to have at least one classic through the year. We even added a month where we chose a book that was made into a movie. We had to let that one go as we really do like to talk and watching the movie left little time to discuss it. There have been a few that didn't work for us (that is not to say they wouldn't work for others). Confessions of a Shopaholic; Shelters of Stone (our testing of Fantasy); The Accidental City. I can't really call them duds because we did talk about them but the discussions weren't energizing. We tend to enjoy books with a little bit of controversy... a little bit of "meat" that we can equate to all of us and today. Have you faced any challenges as a group? When we first began the book club, we all wanted to make it work so badly that we tried following exact rules - these are the questions that you ask when you are the presenter. You have to be really prepared to be a presenter. It was so stressful that we had to give ourselves a shake and ask ourselves what we wanted from the group. How do you structure your meetings? We begin our meetings at 7:30. I let everyone do their catching up and arriving between 7:30 and 8:00. We begin promptly at 8 whether stragglers are there or not. Our presenter for the evening gives us background on the author (if we haven't read the author as a group before) and then different people have different styles. One or two of us make sure that we stay on topic (although that has become the main job of the presenter, sometimes others have to jump in). So you take turns presenting and leading the discussions - does everyone have a different style? My own style is to open the discussion and make sure that there aren't any "lags" and to make sure key items are opened. For instance symbolism, tone, etc. Some of the ladies read from notes and ask and answer their own questions and people just jump in. I used to be really uptight about this way as the whole point is to get everyone's perspective, but I'm not anymore. If the presenter is more comfortable this way, I just try to make sure that they cover everything. Besides, we all have our gifts and I can usually count on those gifts coming up at any given time. One of the ladies automatically sees symbolism (I don't). Another lady is a "rabblerouser," another is the humorist, another is the timekeeper, etc. If the shy ones actually offer to present, we let them present any way they like. Just before Christmas we had two shy ladies team up and they did a fabulous job. How do you handle no-shows, or people coming to a meeting who haven't read the book? Generally 8-10 people show up at any given meeting. Having them every month makes it harder for people to make them all. When people have not read a book (life happens so we don't execute them) they have to pay a loonie (Canadian 1 dollar coin) into the "pot" which goes towards our year end dinner. It's not a lot, as we find that most of our members read the books. I think in the past couple of years I've only taken 3 or 4 dollars. I myself read all of our book club books in the summer (when I have the time) and then review, scan and use reading guides to remind myself of the book. I also take notes when I read. As far as no-shows, if you don't want to be there, I sure don't want you to be there. Unfortunately, we do have a waiting list and I bring that up every once in a while. If it gets too bad (only showing up 2 out of 8 times) then I speak to them directly. If they want to stay in the loop, I will continue to send them updates on our books but there are other people who actually want to be there. I refuse to have more than 16. If they all show up we're in trouble. What's up next on your reading schedule? The remaining schedule for this year is: The Hour I first Believed by Wally Lamb; Look Again by Lisa Scottoline ; After River by Donna Milner and The Gathering by Anne Enright. June is our year-end dinner. With so many years of experience, are there any tips that you'd like to pass on to other book clubs? Every once in a while I like to shake things up or try something new because I think we get into a rut. We've had an author join us for our year-end dinner. We went downtown (some of us) to see Frank McCourt speak and read from his book. This is our fifteenth year and I'd like to do something wonderful but haven't come up with any doable ideas as of yet. I always have the year-end dinner at my place (I'm the only one that can seat 16 for dinner). I always do "loot" bags for them and have a ball searching through the year for new and different things to put in the loot bags. I try to make the evening special, interesting and incredibly fun. It took a couple of years to get the group down to the system that we are today. My theory is that as long as we're having fun, it will stay interesting. If I were to give one piece of advise to any book club starting up I would have to say to relax. Don't relax so much that you don't get any discussion done, but enough that you have a good time and give everyone a chance in their own way. Great advice! Thank you, Eileen, for talking with us about Great Expectations. Here's to many more years of great discussion and fun times.